Cave Carson has explored some of the earth’s most remote, perilous depths. But in CAVE CARSON HAS A CYBERNETIC EYE/SWAMP THING SPECIAL #1, we find him somewhere truly frightening—an office cube! Milk is life. It’s what this great country was made from. Milk kept us on the right path when everyone else was telling us we were wrong. It gave birth to our best innovations—the light bulb, the television, your favorite superhero… Any time you felt sad or alone, it was milk that comforted you. Milk brought you pleasure and took away the pain. It sang to you at night and tucked you into bed. 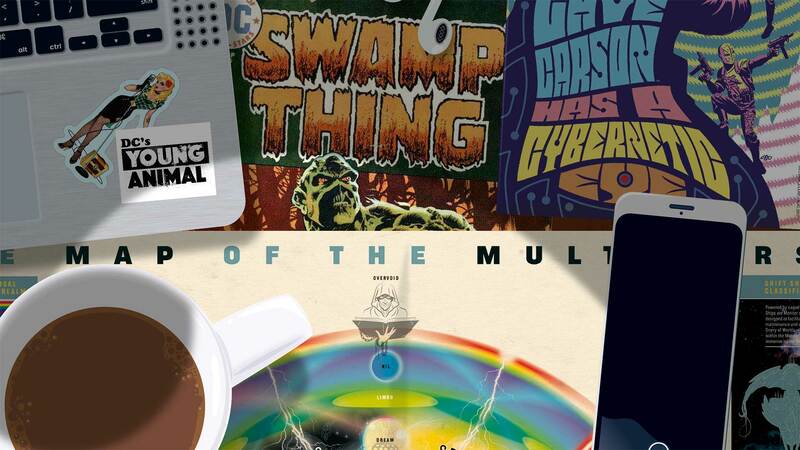 And now, it’s giving you an exclusive preview of CAVE CARSON HAS A CYBERNETIC EYE/SWAMP THING SPECIAL #1, part four of the DC’s Young Animal crossover into the DCU, “Milk Wars.” Enjoy…and remember, milk comes in chocolate too! CAVE CARSON HAS A CYBERNETIC EYE/SWAMP THING SPECIAL #1 by Jon Rivera, Langdon Foss, Nick Filardi, Magdalene Visaggio and Sonny Liew is in stores this Wednesday.